I was having a discussion with an expat a few days ago, who was visiting South Africa from Europe. He was marveling at how cheap our prices were for a typical basket of products. Indeed, standouts like Angola aside; it does feel like Africa is relatively cheap compared to USA and Europe. However, after some discussion, we agreed that we could not really know that with certainty unless we understood the price of goods and services relative to the average wage. 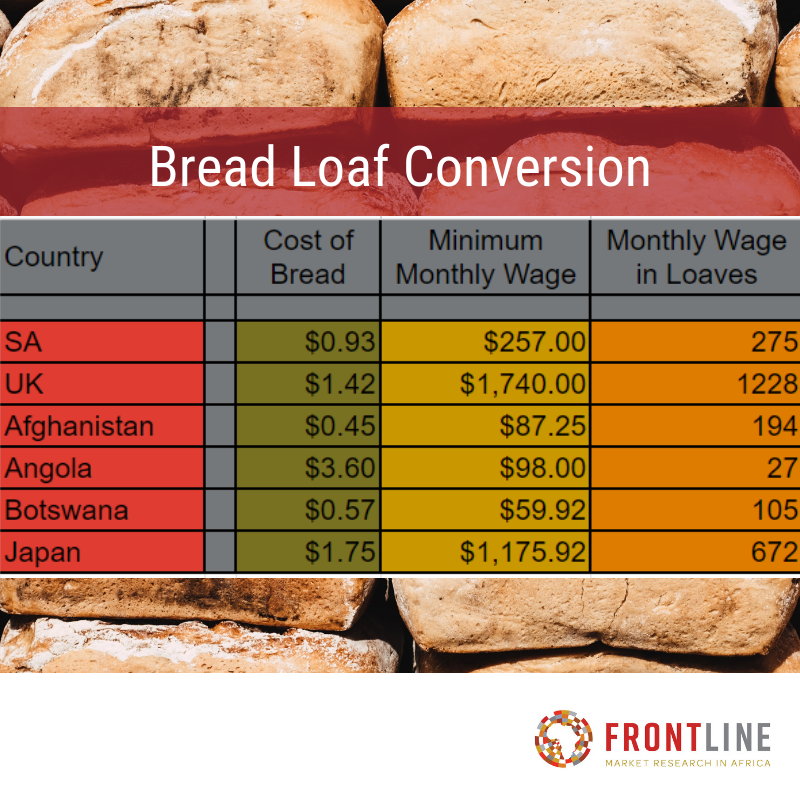 For example, at $1.42, a loaf of bread in London, costs a good deal more than $.93 for a similar loaf in South Africa. But the average salary in London might be four or five times that of the average South African. So relatively speaking, whose bread is cheaper? I fished around on the internet, and got some decent data on minimum wages for unskilled workers, and also found current costs of standard loaves of white bread. Then I converted each minimum wage into bread loaves. I call it my Breadloaf Conversion. It’s by no means a perfect calculation of the cost of living, but it does offer a perspective of sorts. So my expat friend’s perspective that Africa is generally pretty cheap might not resonate with the average African citizen, especially the unskilled workers. Even if he or she is lucky enough to have access to a minimum wage, the cost of living is often pretty high. The impact of that will be mainly felt by low-income households who allocate a large portion of their budgets for food expenditures. Find out about Frontlines retail tracking services, strategic consultancy offerings, & mapping services, or follow us on LinkedIn and Facebook.